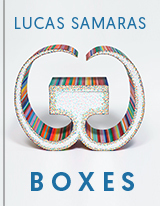 The catalogue raisonné of Lucas Samaras’s boxes will explore the artist’s iconic series of mixed media works. Samaras began creating boxes in the early 1960s to explore the boundary between outer appearance and inner psyche. His boxes often delve into the subject of the self, allowing viewers access into the artist’s mind through personal and found objects or manipulated self-portraits, which are sometimes guarded by pins, razor blades, or broken glass. In addition, many of these works are distortions of the form of the box itself, with playful multi-colored appendages or constructions made entirely of chicken wire. “We live in boxes, see and eat with boxes, travel in boxes, and even our days and nights are boxes… I found myself making boxes. And I thought that box was as important a form as the rest of the art forms or categories. The professional scribblers were not willing to consider it as mainstream art. I stubbornly persisted in waiting for new verbal criteria to be formulated,” wrote Samaras in the catalogue for his 1972-73 show at the Whitney Museum of American Art. Current and past owners of Lucas Samaras works are encouraged to contact Editor Hannah Barton at hbarton@artifexpress.com.